These pages detail the results of a photographic survey of the standing structures associated with Stonar Cut. The photographic survey is part of an ongoing Watching Brief commissioned by Kent County Council for a new road system which may shed further light on the sequence of construction within the Stonar Cut. 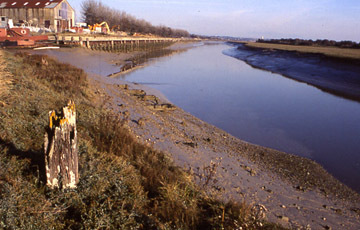 The Stour and the River Wantsum represent the remains of the wide channel which once divided Thanet from mainland Kent known as the Wantsum Channel. Stonar cut is located within the Wantsum Channel. The Cut was constructed in 1776 following an Act of Parliament passed on the 29th November 1774. 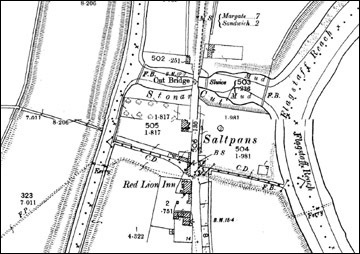 It was constructed near the site of a Salt Works making use of an existing sluice. The cut was constructed as a flood relief mechanism for drainage of what was known as the general valleys which is the watershed of both sides of the Wantsum Channel. 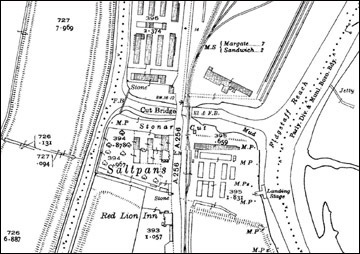 The features recorded in the survey appear to date to the establishment of the Richborough Port and associated facilities between 1916 and 1918. Extensive structural works were carried out near Stonar Cut during the First World War. The existing sluice system recorded may date to that period but has been adapted in more recent times to use an electric motorised system. Remnants of retaining walls and timber pile structures consolidating the banks were observed in addition to debris from the recent redevelopment of the area. 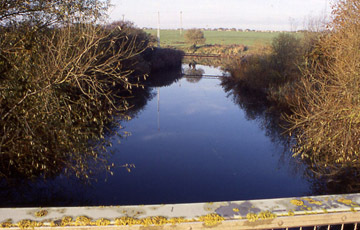 The road bridge and sluice structure are late 20th Century constructions, broadly located on post First World War predecessors. The timber structures and retaining walls are harder to date. 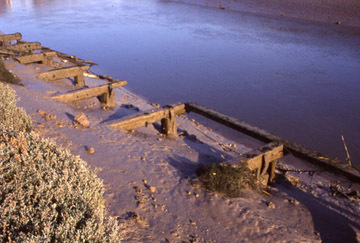 The timbers are very similar to the piled structures erected on the foreshore along Flagstaff reach and in the timber wharf. The materials are also similar but less complex than the remnants of Richborough Wharf that exist north of the cut. The wharf was formed by driving sheet steel piles into the river embankment then dredging and excavating the bank up to the wharf. A protective timber structure was also driven along the face of the steel piles on to which mooring posts and facings were added. The timber pile structures extant within the channel of Stonar cut represent two continuous rows which are set behind the brick retaining walls. By the edition of 1938, when the extensive works carried out in the First World War are first recorded on the maps at large scale, the banks of the cut are shown as sharply defined curvilinear and right angled shapes. A bridge for the East Kent Light Railway, sluice and footbridge were added to the east of the road bridge. This suggests that the existing banks were consolidated and structured using the driven pile structure faced with a brick retaining wall. It is likely that these improvements were carried out by the Royal Engineers during the general construction work for the establishment of Richborough port between 1915 and 1918 and perhaps specifically the construction of the new wharf in 1916. It is possible that the sluice gates in part date from that period with the electric motors powering the gates being added in the latter part of the 20th Century. In the years after the Second World War the infrastructure of Richborough port declined. The structures either side of the cut have been demolished and a new warehouse unit constructed on the north side. A bridge for the East Kent Light Railway, sluice and footbridge were added to the east of the road bridge. This suggests that the existing banks were consolidated and structured using the driven pile structure faced with a brick retaining wall. It is likely that these improvements were carried out by the Royal Engineers during the general construction work for the establishment of Richborough port between 1915 and 1918 and perhaps specifically the construction of the new wharf in 1916. It is possible that the sluice gates in part date from that period with the electric motors powering the gates being added in the latter part of the 20th Century. With the loss of Richborough Power station constructed in the 1960’s and a number of other factories and industrial units, combined with the general economic decline of the Pegwell bay area with the loss of a Hover Port also established in the 1960’s and closed in the 1990’s, much of the port has been eroded by the river and reclaimed by nature, little remains to demonstrate the enormous output of the port in the years of the First and Second World Wars. Much of the machinery including the electric lifting bridge and the three train ferries operated from Richborough port were transferred to Harwich in 1924. Two of the ferries continued in service until the 1950’s and the lifting bridge was in operation into the 1980’s. It is a product of secrecy with which the Richborough port was established that the implications of the port to the history of the development of mechanised cross channel freight operations are not widely known. The standing structures at the Stonar Cut, which all appear to date from this period, reflect the scale and transformative power of such an undertaking. Butler, R. 1999. 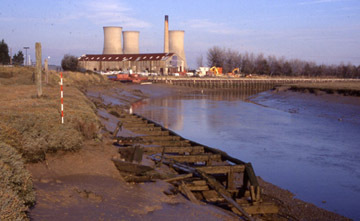 Richborough Port. Pfizer Ltd, Sandwich. Chamberlain, D. M. 198?. The Ancient Town and Port of Stonar. East Kent Maritime Trust. Hardman, F. W. and Stebbing, W. P. D. 1940. Stonar and the Wantsum Channel. Part I – Physiographical. In Archaeologia Cantiana Volume LIII pp 62-80.